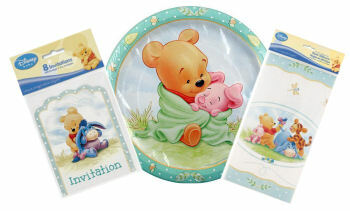 The unique Winnie the Pooh baby shower invitations that can be bought or that hostesses can make themselves keep the classic Pooh baby shower theme looking trendy and modern and very inviting. You might think that all the color pictures from the book had been copied onto all of the Pooh invitations, plates, cups and napkins so many times that they would have run out of both images and ink, but that is not the case. Winnie the Pooh is the star of the baby shower or birthday party decorations and his woodland creature friends and neighbors from the 100 Acre Wood are positioned close by offering their festive, decorative support. Pooh baby shower invitations are so cheap that I can’t imagine why anyone would want to go to the trouble to make their own. However, some people like the option to personalize their invitations with their own wording, poems or colors. Artists that prefer to design their own Pooh shower invitations might purchase a classic Winnie the Pooh rubber stamp set, colored inks, card stock and envelopes. Change ink colors for Eeyore, Tigger, Piglet and Pooh and use sparkling embossing powder to make your artwork really shine! Go here to see all of the party and craft supplies that can be used to make cheap baby shower invitations and decorations that look amazing. 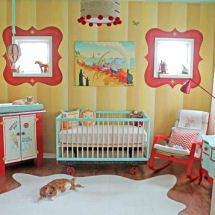 Pooh Bear invitations and party decorations continue to be a favorite of moms-to-be as well as hostesses. The most popular shape of the cards may change from a square to a rectangle from year to year and the styles and colors vary but the basics remain the same. If Pooh invitations that involve lots stamping and embossing are out not your idea of fun, you can decorate plain white paper and envelopes with embossed stickers and borders for inexpensive, personalized Pooh Bear baby shower invitations that will delight your party or shower guests. Return to Unique Baby Gear Ideas for more creative ideas for Winnie the Pooh theme invitations, party supplies and decorations to make yourself.